MC Madame Onça has been hired as Mistress of Ceremonies at bellydance, music and burlesque festivals and shows, from Colorado to Washington DC. She provides a gilded frame for the mainstage action, in a campy but elegant cabaret style, able to keep the pace moving and the energy high, come what may. Bellydancer Onça’s skills as an entertaining bellydancer are notorious, and have garnered her peer respect nationwide. She excels in both intimate venues such as restaurants and clubs, as well as large festival stages, and thrives on the spontaneity of meeting the mood and needs of the crowd. She present veil, fan, sword, and fire, and revels working with live music & djs. Madame Onça was first in the world certified in General Skills by founder of American Tribal Style, Carolena Nericcio. Her dance company, Baraka Mundi, was nominated for Best Kept Secret in the Golden Belly Awards. She is producing a series of Instructional DVDs on bellydance, the first being released in spring of 2014. Singer A powerful vocalist with alot of soul and alot of voice, Onça carries the crowd every time with her work as a soloist. Seamlessly blending a capella torchsongs with her work as an MC, she offers audiences something fresh and unexpected. Now lead vocalist in Richmond, VA’s whisky lounge Americana band, Cardboard Poncho, she has a lifetime of music behind her, and also toured for five years in the US as female vocalist in a Balkan fusion band. To hear Cardboard Poncho, welcome to the Soundcloud link below. More information on Madame Onça’s career as an entertainer Solo act: 1999-present. Madame Onça has been the featured Mistress of Ceremonies, stage character, and songstress at events throughout the United States, including the Carolina Burlesque Festival, Suncoast Burlesque Festival, TribalCon Bellydance Festival, Elevation Bellydance Festival, and many others. Cardboard Poncho 2013-present. 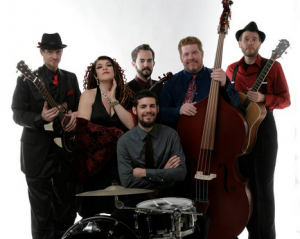 Onça is lead vocalist and stage character for this Virginia-based Neo-Vaudeville ensemble, playing Whisky Lounge Americana at weddings, parties, clubs and festivals. 2007-2012. Toured nationally for five years performing Eastern European party music in a roulade of good looks and bad behavior. Baraka Mundi the Bandit Queens of Bellydance 1999-2009. Madame Onça’s bellydance and live music troupe had up to 6 dancers and 4 musicians, performing arabic-inspired music and dance at music and medieval festivals, schools and private events. Baraka Mundi was nominated for both Best Kept Secret and Best Dance Company in NC.